It is a controversial topic that Arizona politicians have been arguing over for more than a decade. Some call it "death with dignity," while others call it physician-assisted suicide. 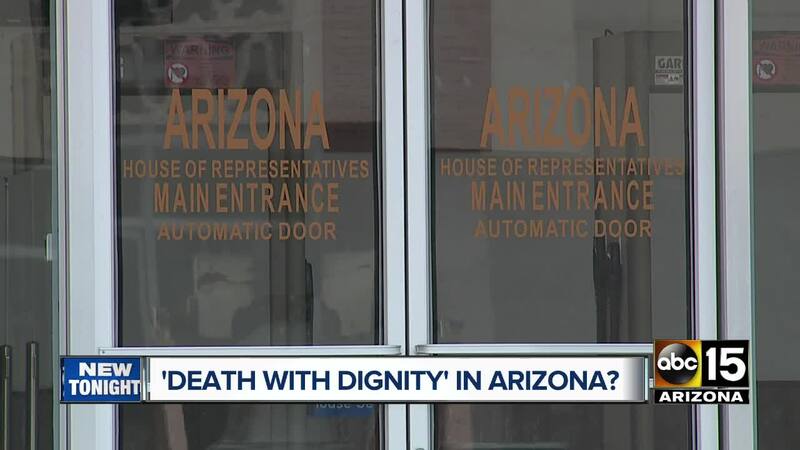 State democrats are trying again to make Arizona the eighth state in the country to adopt a "death with dignity" law. The bill would allow terminally ill patients to legally end their life, after consulting their doctor and providing sane, written permission, as well as a waiting period. The details are eight pages, outlining the conditions needed for a person to qualify. Barbara Paymaster met Ginny in grammar school, when both were just three years old. The two stayed close friends for life. "She lived in Tempe for a while, and Tucson," Paymaster said. "She was a very dear friend of mine." In 2018, Ginny was living in Oregon and her health was failing. She had a rare blood disease, kidney failure and other illnesses. Chemotherapy was not working either. "That's when she decided that she did not want to continue with this. It was not working. She was very ill, she could not go out. Her quality-of-life was horrible." In April of 2018, at just 69 years old and with months to live, Ginny decided to legally end her life. "You have to go through certain steps, you have to be in hospice. You can't just say I want to do this 'dignity with death.' You have to go through a process," Paymaster said. "I don't think the government should get in between those decisions," Representative Pamela Powers Hannley, the bill's main sponsor, said. The bill was first introduced in Arizona in 2003 . It has been introduced in each of the last three sessions, but has never made it out of committee. "More people come every year to the capital and contact legislatures," Rep. Powers Hannley, (D-Tucson) said. "They tell me, 'I should be able to make that decision, my own decision,'" Rep. Rich Andrade, also a Democrat, said. While supporters say the bill allows for compassion, critics say it puts pressure on relatives who may feel like a burden to take their own life. They also argue it is morally wrong. For Paymaster, she thinks back to her friend Ginny and smiles, knowing she went out on her own terms. "She was at peace with it," she said. "There's a lot of thought that goes into it and I think people should be able to have that choice."